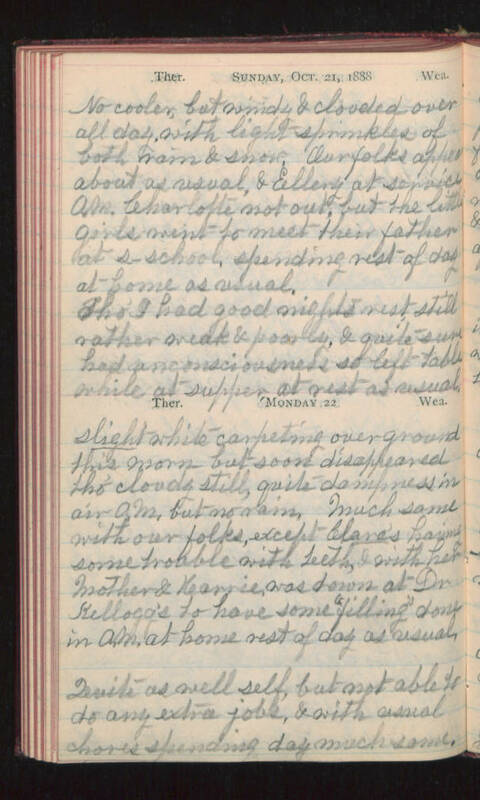 Sunday, Oct. 21, 1888 No cooler, but windy & clouded over all day, with light sprinkles of both rain & snow. Our folks appear about as usual, & Ellery at service A.M. Charlotte not out, but the little girls went to meet their father at s-school, spending rest of day at home as usual. Tho' I had good nights rest still rather weak & poorly, & quite sure had unconsciousness so left table while at supper at rest as usual. Monday 22 slight white carpeting over ground this morn- but soon disappeared tho' cloudy still, quite dampness in air A.M. but no rain. Much same with our folks, except Clara's having some trouble with teeth & with her Mother & Karrie, was down at Dr Kellogg's to have some "filling" done in A.M. at home rest of day as usual. Quite as well self, but not able to do any extra jobs, & with usual chores spending day much same.